Intelligence Service to the Barents Observer in 2016: Marjata will still have Kirkenes as home port. 2019: No comments. The sources point to Russian intelligence as ”very close” when the spy ship is at port. Packed with radar- and communication humps on the roof, the 125-meter long new “Marjata” came to Kirkenes in spring 2016. The ship is the fourth in a row named “Marjata” with the aim to monitor Russian military activities in the Barents Sea region. The change in wordings for quote is conspicuously. 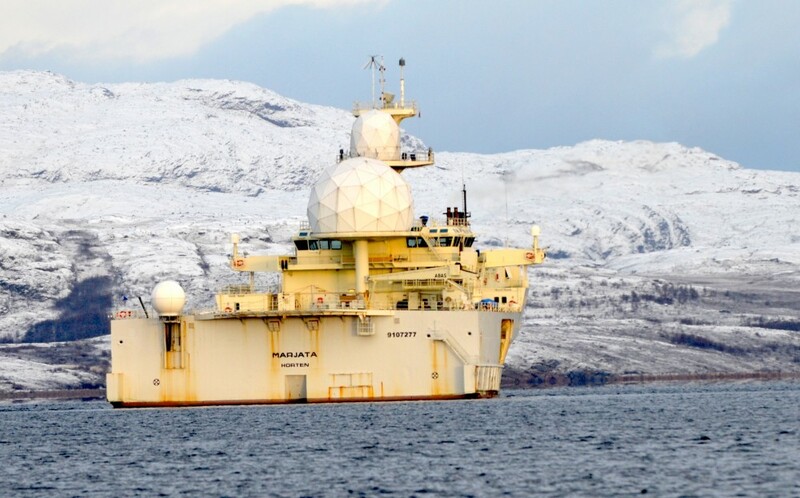 AldriMer.no writes that foreign intelligence services, especially Russian, over the last two years have shown an intensified interest towards Norway’s two spy ships; “Eger” and “Marjata”. “Eger” is the former “Marjata” - making port calls to Kirkenes until 2016, but is now sailing out from Harstad and mainly operates in the Norwegian Sea. The port of Kirkenes is less than 8 km from the border to Russia’s militarized Kola Peninsula.